I want to write tonight. I do. But there’s just too much…stuff. Too many thoughts to write, too many things to do. Because, while I want to write, I also want to take the hour or two that my children are in bed to watch Once Upon A Time. I have guilty pleasures. I also need to figure out babysitting for the next couple months, and how I’m going to survive being a retail widow again this year, and dealing with something else that I can’t really talk about, but is stressing me out something fierce (don’t worry your pretty heads, it’s nothing too horrible). Instead, tonight, I’ll just write a few things I’ve been thinking about. Maybe I will do this every now and then, so at least I post something. 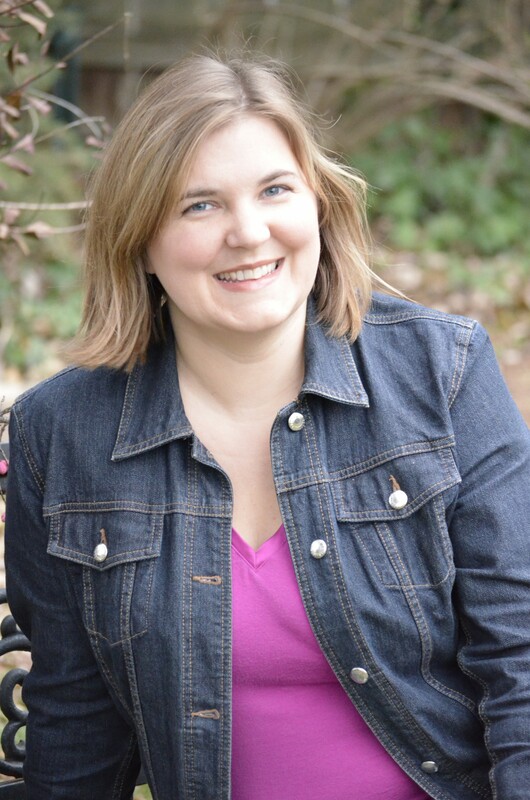 I haven’t given myself a weekly or monthly goal for blogging, because, let’s face it, I’m just not that kind of girl. But maybe this way I can just say a few words, and keep them fresh in my mind, and can elaborate later. – There is a reason why so many people in this world hate Christianity (and other religions as well), and that is quite possibly the reason some Christians (and followers of other religions) leave their faith. Ponder that. – It shouldn’t take more than five minutes for children to get ready for bed. Brush teeth. Go to the bathroom. (A half hour later and they were surprised that they didn’t get to read books tonight?). Seriously. – I will continue to analyze, speculate, and decipher my life’s purpose and meaning. I may never find my answer, but if I don’t question it, then I’m not being true to myself. Just a quick little post tonight because I haven’t written one in more than a week. Our computer died, but now we have a new one, so I can blog-a-log again. Woo-hoo! We took a short trip to Chicago this past weekend. Beatrix bought an American Girl doll. That, my friends, is an entirely different blog post in itself, but I’ll process that some other time. How Does a Sensible, Prudent Man Put Up With a Mess like Me? See that crafty video idea up there? Notice also my penchant for procrastination? Yeah, that’s pretty much me. I’ve been pondering my personality lately. My husband’s too. Sometimes I feel like I have changed so much since I became a mother, I can’t imagine how he puts up with me anymore. Last night, we both took Meyers-Briggs personality type tests (free ones we found here and here). I’m not sure why I feel this need to discover myself. In one respect, I want to understand the differences between Stewart and me. I want to be able to work together better. In another respect, I feel the need to validate myself for being such a mixed-up pile of emotion, creativity, thoughts, ideas, inactivity, perfectionism, fact, and fiction. Sometimes I feel like there’s something wrong with me and I need to “fix” my personality. I’m an Introvert, but that doesn’t mean I’m shy or don’t like people. Rather, I’m introspective, aloof, distant, cynical at times, but generally laid-back. I’m pretty balanced between my Intuitive and Sensing preference. Intuitive people are imaginative, filled with ideas, and focus on what might happen. Sensing personalities are observant, practical and down-to-earth. My third preference (how I make decisions) is Feeling. “Feelers” follow their hearts and crave peace, harmony, and cooperation. Perceiving, my fourth preference, means Iam flexible, open-minded, and like to mix work and play. 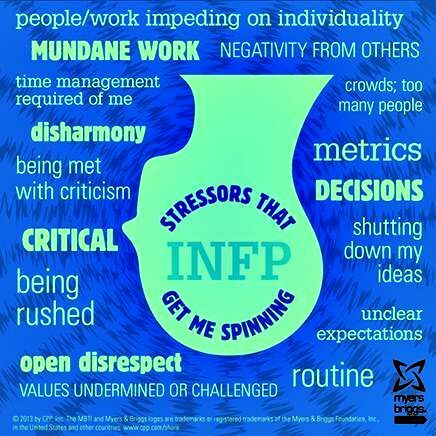 I won’t go into more detail about the tests and meanings of all the Myers-Briggs types, but you can Google them or go to The Myers & Briggs Foundation Website, or to 16 Personalities, where there is a free test to find your personality type. 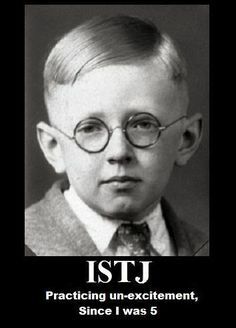 My husband is an ISTJ (Introverted, Sensing, Thinking, and Judging). He’s dependable, reliable, quiet, unselfish, and able to take responsibility (though he doesn’t necessarily like to be responsible). The answer is “I have no idea.” But he does tolerate me. I guess when we fell in love, there was something about me that he felt was worth the “long haul.” We compliment each other in strange ways. He plans a budget and sticks to it. I’m horrible with spending, but great with balancing our check book and figuring out all the numbers. He helps me find more realistic ways to think about things and keeps me from taking my ideas to the next level without making a plan. I compel him to have fun, find his passion, and “live a little.” He keeps me motivated and helps me out of my moods by asking me to take a walk or ride my bike with him. Our sense of humor is one thing we share, as well as our love of weird sci-fi/humorous/mystery/eclectic novels, movies, and TV shows. Also, we cry about things. I cry a lot. I cry about happy things, sad things, feeling angry, feeling overwhelmed, and all the precious things our children do and say. He cries during movies, especially movies about sports and overcoming obstacles. He cries every time I read DragonTales Race to the Finish! to the kids. He’s a private person, so I’m sure that sharing this information with all the Inter-Webs will bring him great joy. I like to share my life – in writing, mostly – so, you know, he’ll understand. Maybe. And…that’s about it for Stewart’s crying. Except for this one time. He wasn’t watching a movie or listening to a story. 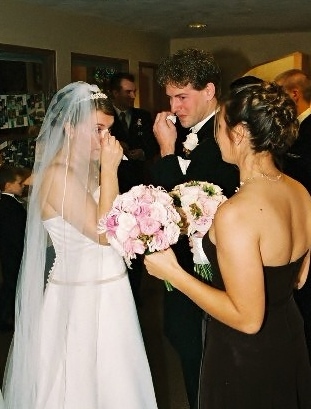 It was at our wedding, right after we walked back down the aisle together. I’m pretty sure they were happy tears. Understanding our personality types will help us in the long run (and his personality will ensure there is a long run). Even when I’m exhausted, but refuse to go to bed, or when I complain about the house being a mess, but rarely clean, we’ll still be okay. I will (try to) keep my ideas to a minimum. What would that number be, exactly? How about 183? That sounds reasonable. I will stick to that budget of ours, as long as it includes just a teensy bit of wiggle room for the occasional fast-food dinner and random thrift-store find that I want to repurpose into something crafty (even though I won’t get around to it until five years from now…or ever). I will probably-maybe-no-not-really clean more, and I might take better care of myself. Stewart, on the other hand, will do the things he says he’s going to do. He makes a plan and sticks to it. I try to keep our options open, because I never know how I’m going to feel tomorrow. Somehow, that works for us. I love him, he loves me, and even though we frustrate each other, we will keep laughing and crying, and living this messy, crazy, beautiful life together. He will wish it were clean and calm, but I know he would never want to change the beautiful part. Because that beautiful part? That’s US. 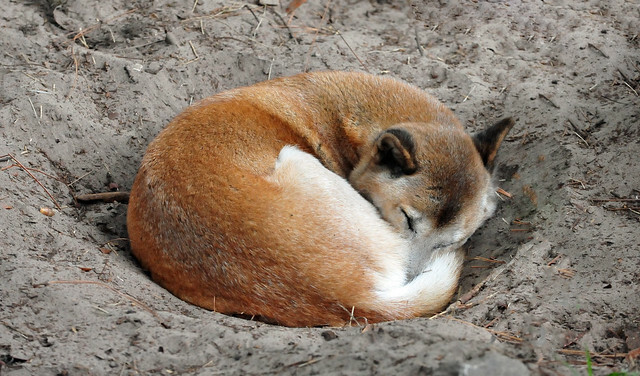 On cold nights in Australia, Indigenous people would sleep in a hole in the ground, with a dingo curled up next to them to keep them warm. About two years ago, I sat Stewart down to have a serious discussion. Almost an argument, but not quite. I had been pushing for a while to get a dog. Stewart likes dogs, but he’s not a dog person. However, I made it clear that in the near future we would have to get one. I never imagined our family without a dog. It was a dealbreaker. (Okay, not really, but I didn’t feel I would be “complete” without a dog, and I didn’t want to have any resentment toward him). Stewart’s main concern was that a dog was a huge responsibility, and would take up too much of our time. We had two kids that required enough attention as it was, not to mention two cats as well. You wanna get what, now? After making us suffer through the babies? Whatever. As long as I can still sleep. If The Lorix Chronicles were my home, then I would need to clean house (and possibly add an addition or two). Thank goodness it’s not, because my real home is a disaster and if I wanted to add to it, I’d have to save up for 13 years to put in a 10-square foot closet.